After returning home in a state of high upset, he told the tale to his father who then brought it to the attention of Lee County Sheriff, Liston Truesdale. Sheriff Truesdale took Davis’ report, and also noted the damage on his car, which included a rear view mirror broken off and scratches along the roof of the car. This evidence supported his story, as did the lie detector test which Davis agreed to. Truesdale also noticed that the damage to the car matched other damage reported to the Sheriff’s office, and little did he know that even more reports were to come. On July 14th 1988 Tom and Mary Wayne made a report to the Lee County Sheriff’s Office that their car had been damaged. The sidewalls were scratched and dented, the hood ornament was broken, the antenna was bent,wires from the motor had been ripped out, and it appeared that parts of the molding had actually been chewed, as if an animal had used its teeth to inflict the damage. There were clumps of hair and muddy footprints all over the car. Some short time after Davis’ encounter, two deputies went to the area, and made casts of footprints with 3 toes reportedly found near the road. The authenticity of the footprints has been disputed by biologists and other experts. 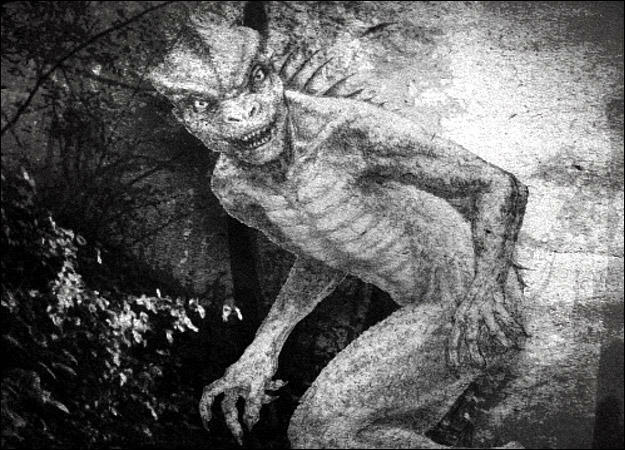 On August 5th, 1988 Kenneth Orr of the Shaw Air Force base reported encountering the Lizard Man on highway 15, where he shot and wounded it. He had scales and a small amount of blood to show as evidence. He never made an official report and redacted his unofficial report after being charged with unlawfully carrying a pistol, and then was charged with filing a false claim. The rash of sightings continued, made by community members who, according to Sheriff Truesdale were very upstanding reliable citizens. The descriptions varied between a green scaly body with red eyes or a brown furry body with no unusual eye descriptions. All descriptions mentioned a creature about 7 ft tall and broad in the chest. Eventually a local radio station, WCOS offered a $1 million dollar reward for a capture of the creature. Of course, this made the number of reports and sightings sky rocket, but the number of credible reports plummeted. The attention also brought press and tourists flocking to the town. Eventually in the frenzy a denizen of the local Air Force base was said to have been caught dressing up in a lizard suit, which cleared the town of press and tourists. Many locals are still strong believers in the lizard man, and the occasional reports still come in. In 2005 a woman in Newberry, SC reported 2 large creatures with green skin and glowing red eyes outside of her home. In 2008 Bob and Dixie Rawson reported strange damage to their car, which press billed as the return of the Lizard Man, but local authorities believed it was nothing other than coyote damage. In 2010 Josh Gates and the Destination Truth team went to the swamp to investigate. 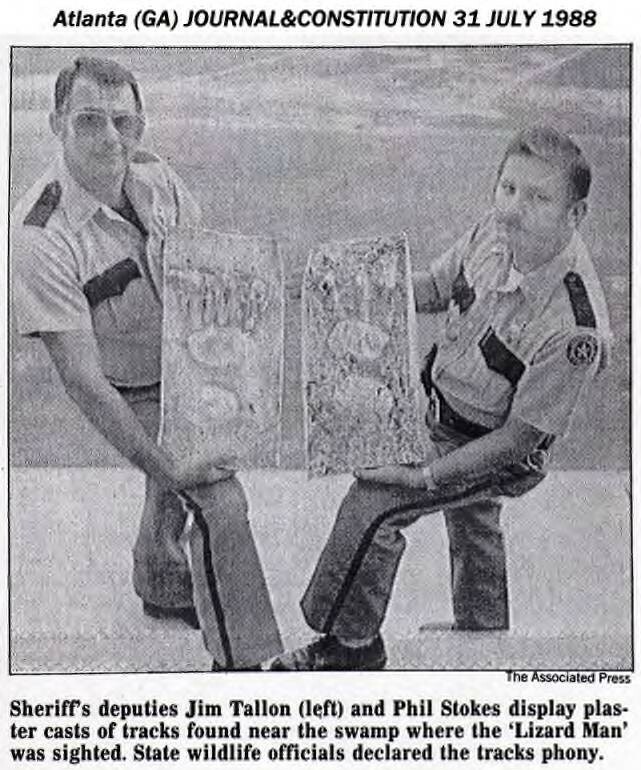 Upon seeing the amount of local merchandising by the Lee County Chamber of Commerce, and after finding a footprint in the swamp, they decided it was most likely a fabricated find. “Lizard Man of Scape Ore Swamp.” RedOrbit. RedOrbit. Web. “Lizard Man Of South Carolina Makes News.” Before It’s News. Portions, 6 Mar. 2013. Web. Rhodes, John. “The Lizard-Man of Bishopville, South Carolina.” Reptoids. John Rhodes. Web.